The baby brother of the whole Airstation series – is it worth the admittedly low price point or are you better of skipping a family size pizza and pony up the money for one of the bigger brothers? Basically the router is a trimmed down version of the WZR-HP-G300NH leaving out ftp access, usb storage and gigabit Ethernet. It runs on a Atheros 7240 @ 400 MHz and has 32 MB ram which makes it about the bare minimum you would want for using it as a proper VPN router. The AOSS on push button setup is a dream that makes the whole setup painless. For good measure it is worth mentioning that all the routers in this series have this option. Since the router comes with DD-WRT firmware installed it can connect to a VPN network right out of the box. The buffalo series is recommended by the market leader Unlocator ( Yes that is the name), and can connect directly to their network. This makes it a breeze to unblock sites such as , Hulu and so forth. Devices such as the Apple TV, Roku Box, Boxee Box, Xbox 360, Playstation 3, Wii, Nintendo 3D, HD TVs, Blu-Ray players and set-top boxes do not have a build in VPN client. This is where the WZR-HP-G300N comes into the picture as it can provide access to a VPN tunnel directly from the router. 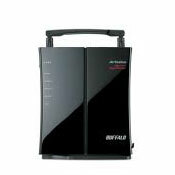 The Buffalo router series is recommended by Unlocator for connecting to their VPN network. 2/5 Stars. I think all the routers in the series are priced pretty close and personally I would go for the WZR-HP-AG300H flagship. Saving $40 and not getting all the bandwidth possible out of my VPN connection is simply a bad investment in my book. On top of that the lack of dual band connections as well as the missing option for ftp access and usb network storage makes this a toy router in my book. While acknowledging the need for shopping within a budget I think it is a bad choice to simply shop for the cheapest option here.